Introduce a rustic country look into your home with this end table. 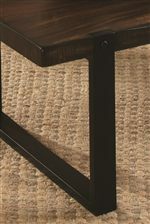 The table features a two-tone Vintage Brown and Black finish that gives the table an authentic rustic feel. A simple frame offers versatile appeal, as the table will suit anything from casual to more contemporary styles. The 70342 End Table with Two Tone Finish by Coaster at Furniture Discount Warehouse TM in the Crystal Lake, Cary, Algonquin area. Product availability may vary. Contact us for the most current availability on this product. The 70342 collection is a great option if you are looking for Casual furniture in the Crystal Lake, Cary, Algonquin area. Browse other items in the 70342 collection from Furniture Discount Warehouse TM in the Crystal Lake, Cary, Algonquin area.